PowerWorld products provide numerous Geographic Information Support (GIS) features, including the ability to import GIS ESRI shape file data into PowerWorld applications. Using shape files, our customers can display virtually any type of information on system diagrams. Import real-time GIS ESRI shape file data to display up-to-date weather information on transmission system diagrams. Latitude/longitude coordinates for Bus and Substation objects can be specified; these objects can be automatically inserted into diagrams based on the coordinates. Background lines can be converted to transmission lines, substations or buses. This allows you to import transmission elements as GIS shapefile data, then convert the imported drawing objects to modeled system objects. 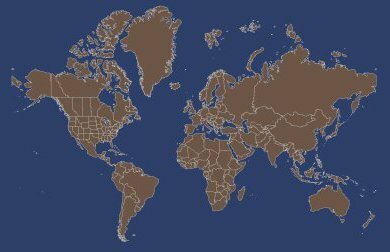 Version 11.0 added a Mercator (map) projection for use with borders outside of North America. The PowerWorld library includes borders for the entire world. North American borders include both state and county borders, as well as Canadian Provinces.